We've seen all kinds of terrariums here at Inhabitat -- from your tabletop variety to wearable ones and even terrarium nails. But for the holidays, we thought it would be fun to come up with something totally new by creating DIY edible terrariums that you can serve to your friends and family. Read on for our video showing you how you can replicate these little morsels of botanical wonder for your next soirée! 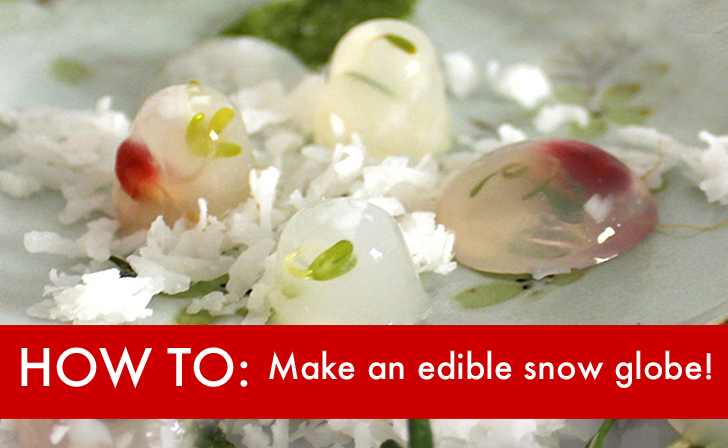 To learn how to make an incredible DIY edible snow globe that will impress all of your friends at your next holiday party, read on…. Whisk the coconut juice and agar agar together in a saucepan over medium heat and bring to a boil. After the mixture comes to a boil, lower heat and continue to whisk for about three minutes. Pour the coconut juice and agar agar mixture into your molds (you may want to transfer the mixture into a measuring cup or other container with a spout first). Let the liquid set up for a minute or two until it starts to gel partially but not all the way. Agar agar will begin to set up at room temperature so make sure you keep checking back every minute or so or you’ll end up with empty snow globes! If that does happen, though, don’t sweat it too much. You can always just heat the gelled agar agar up again to liquefy it. Now for the fun part! Start adding in your “plants.” I used sprigs of thyme, basil leaves, mint leaves, cut pieces of kiwi, and pomegranate seeds for my edible terrariums but you can choose to use any herbs you like. Once the agar agar begins to set, it should be easy to place your decorations into the solution without them dropping to the bottom. After your edible terrariums have hardened, start popping them out of the molds and plating them on dishes or platters adorned with additional herb sprigs and a bed of coconut flakes. Step 1: Whisk the coconut juice and agar agar together in a saucepan over medium heat and bring to a boil. After the mixture comes to a boil, lower heat and continue to whisk for about three minutes. Now for the fun part! Start adding in your "plants." I used sprigs of thyme, basil leaves, mint leaves, cut pieces of kiwi, and pomegranate seeds for my edible terrariums but you can choose to use any herbs you like. Once the agar agar begins to set, it should be easy to place your decorations into the solution without them dropping to the bottom. Step 4: After your edible terrariums have hardened, start popping them out of the molds and plating them on dishes or platters adorned with additional herb sprigs and a bed of coconut flakes.